Why do pugs like pizza so much? I'd tell you the reason, but it's too cheesy! This week we fell victim to the pug pizza box meme! 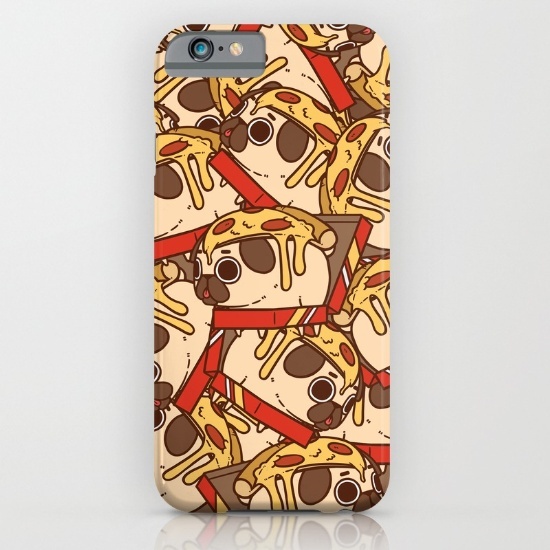 What do you get when you mix pugs and pizza box? Ill tell you what. A super cheesy messy combination of our two favorite things! So Momo scoured the net and found her 16 favorite pictures of pizza loving pugs just for you! we all need a pizza pug bean bag bed! Buy your pizza pug bean bag here! Whoever made this psychedelic pizza pug is a genius! @itsdougthepug always has the best photo shoots! jelly!!! Thats all for pug pizza pics !We'll keep searching for more pizza, but in the mean time, we leave you with this pug twerking for pizza video from our buddy Doug! Its worth it! Mean Mug Pug Ozzy eating his first slice of pizza with everything! Note:Can I feed my pug pizza? Pizza is one of the all time favorite american foods! And why not? Its basically cheese and bread combined with a little sweetish tomato sauce to form a magical new entity! We can all agree that pizza is delicious, but can your dog digest a slice of pizza? Thats a whole other question. The truth is all pizza's are not made exactly the same. Some might have a ton of meat, some might have a ton of cheese, some might have toppings your dog should't eat, and some grocery store bought pizza will be filled with preservatives you don't want anywhere near your pugs digestive system! Time to spoil this pizza pug party! A good general rule is not to feed your pug 'people food'. Dogs are happiest with a consistent diet. Remember they don't need the variety that we do. Remember that the ASPCA has "people food" as one of the leading causes for animal poisoning. First: A unassuming slice of pizza could unwittingly contain toppings that are actually poisonous to pugs. Two super bad ingredients that are often found in the sauce itself are Onions and Garlic. Onions contain Thiosulfates which your pug can not digest! Eating too many onions can cause diarrhea and vomiting! Now, if your puggy snatches the stray onion when your not looking, dont freak out, but I would say its a good idea to avoid the temptation all together. Second: Pizza is oily, salty, fatty. Three things that make it mega delicious, but can also cause trouble for you best friends digestive system. In conclusion: Stick to your pugs normal diet and keep the pizza as "look but dont touch"